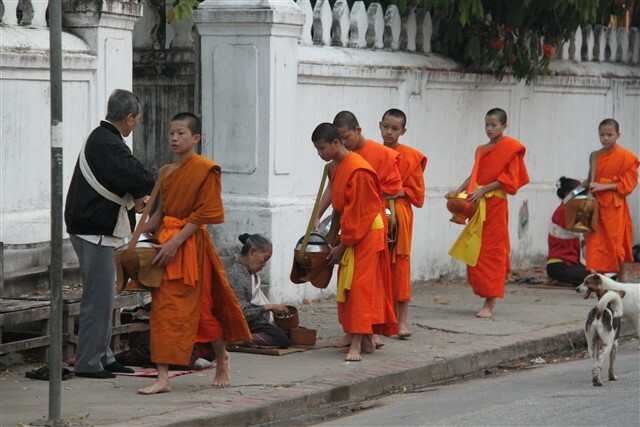 As a typical tourist in Luang Prabang, Laos, I also took part in the Morning Alms Giving observation in the proper manner I could think of. This means observing the timeless religious rituals from a distance. If you are going to Luang Prabang, please take the time to read “A Guide for Tourists in Luang Prabang” and be respectful while observing the religious act in the morning. If you are going to take part in the ceremony, please don’t buy rice or food items from the vendors along the routes but ask your guest house or hotel to make fresh sticky rice for you in the morning or buy fresh made rice at the local market.